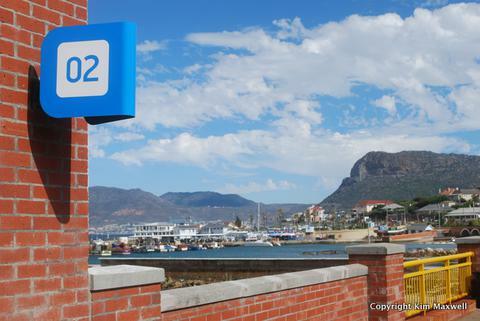 R30 adult Metrorail ticket for a hop on/off Cape Town - Simonstown return by train. 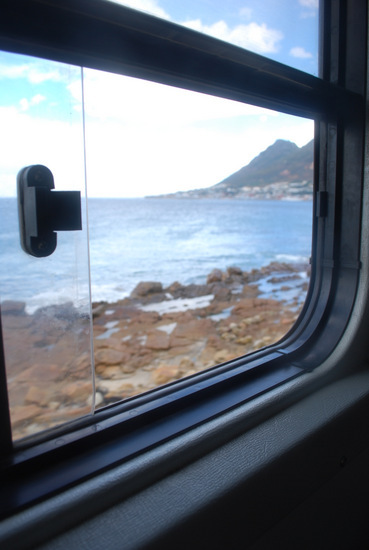 Window views of Muizenberg swell bursting with bobbing surfers, families playing in tidal pools, and people walking the wave-lapped cliff path to Kalk Bay… Too tempting to ignore. After approximately 45 minutes of being lulled by conductor whistles and doors opening then closing, we disembarked at St James beach and continued on foot. 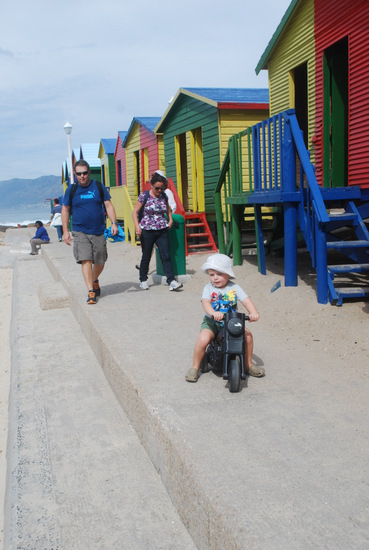 Smart move with the cars entering Kalk Bay all idling or stuck in first gear. We made it just in time for a lunch booking at old favourite Live Bait, situated underneath Harbour House. It’s always been more about the panoramic harbour and wave-crashing sea vistas from the glass “walls” than about outstanding seafood or stellar service at Harbour House’s smaller, casual little sister. So I’ve learnt to keep orders as simple as possible, and then soak up the seaside vibe here because sauces or vegetable components of a dish tend to be fussy or fit badly (Case in point: today’s calamari batter contained yellow turmeric powder?) 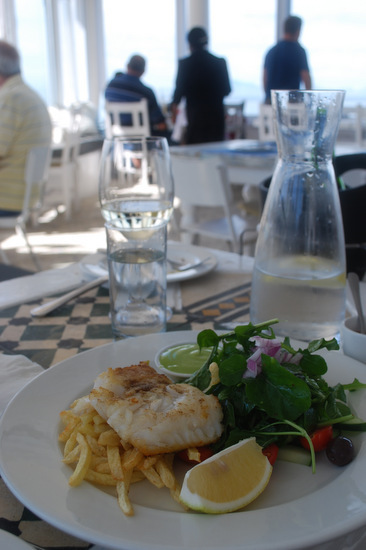 The requested children’s grilled hake with chips looked particularly impressive (R55), if somewhat green in tone for a young child, thanks to a handful of red onion-topped leaves, plus a herby mayo? Thankfully the adult elements of the table were happy to snack on the side salad, while the offending green gloop was hastily replaced by tomato sauce. I’ve forgotten how great Buitenverwachting Buiten Blanc 2012 (R125) is with fishy dishes. This uncomplicated white blend hits all the right notes. Grilled cob was a delight, fresh and cooked perfectly, unlike the shoestring chips cooked in oil that hadn’t been heated sufficiently, leaving some undercooked and most just soggily warm. Apparently operating a basic deep-fat fryer is an art. A point on trains: there are only two platforms for stations on the False Bay end, so train timetables are fairly easy to figure out. But they only run approximately every hour on Sundays, so take note of times to avoid a long wait. We continued to the end of the line to Simon’s Town along wave-splashed tracks. Before the return Cape Town leg, just enough time for a 20 minute walk into town, a decent coffee and some teatime treats from The Sweetest Thing Patisserie. 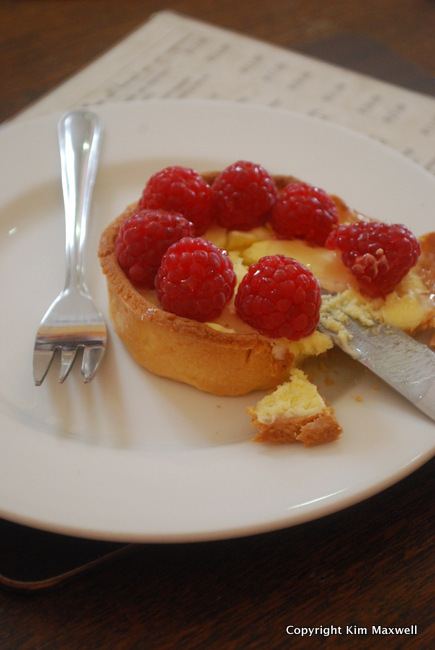 A lemon custard tartlet in a biscuit shell topped with raspberries, and warm scones with jam and cream. What more could anybody want from one day out?